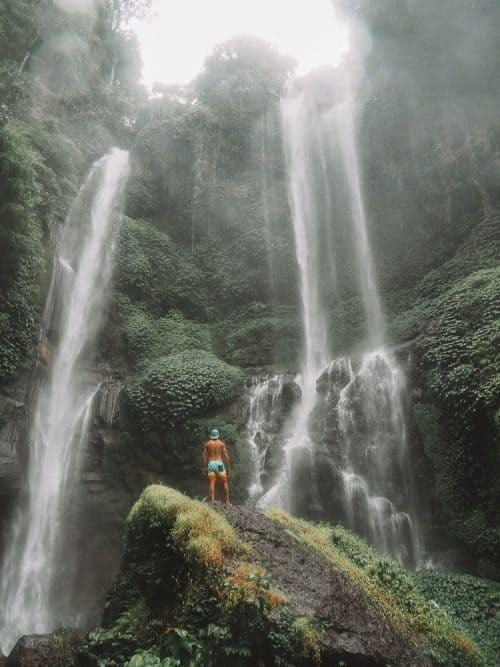 Sekumpul Waterfall is known as ‘The Best Waterfall in Bali’ and for a damn good reason! There is a mecca of waterfalls in this region to be explored, so what are you waiting for?! 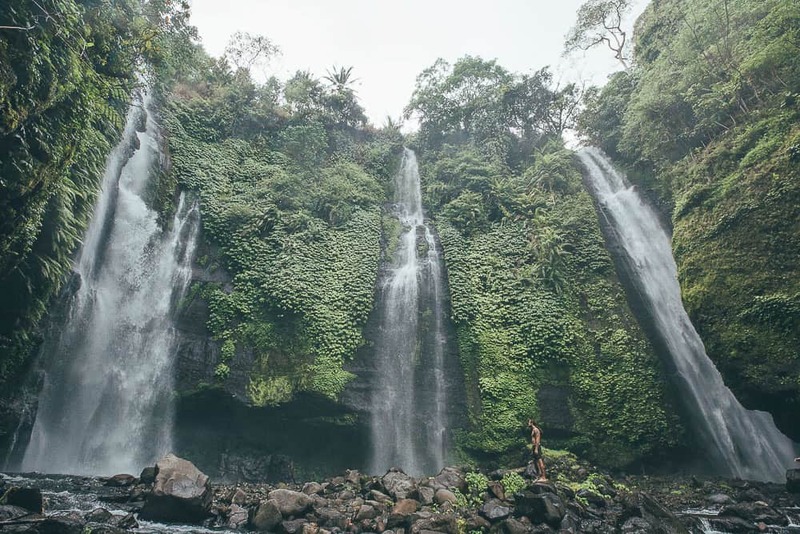 Sekumpul Waterfall (Air Terjun Sekumpul) is located in the northern region of Bali, approximately a 2.5-hour drive from Denpasar. You can hire a driver and car for around $50 for the day, just ask your accommodation to arrange this for you. 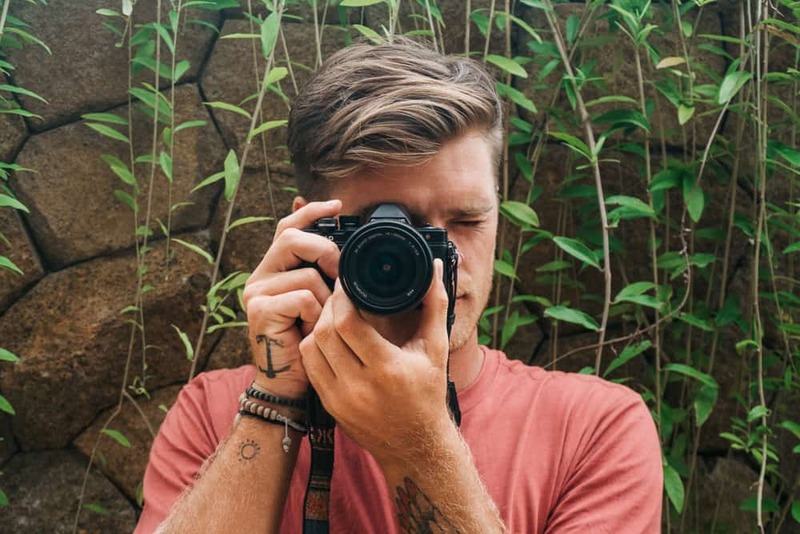 If you like to ride scooters, you can find scooter rentals shops practically everywhere in the main tourist hubs such as Kuta, Seminyak and Canggu. The scooters can be rented for around $5 a day with a full tank of gas. This is my preferred means of travel around Bali, as it is cheap and you can stop anywhere and anytime you like! The road gets very windy and steep as you head through the hills of Bedugul and it is a common route for trucks and other commuting vehicles. So please take care and don’t overtake unless you think it is safe to do so. You can find some epic viewpoints on the side of the road that are definitely worth stopping for, a favourite of mine is the Strawberry Hill Lookout. When you arrive at the car park to Sekumpul Waterfall there is a small hut where there may be a group of local tour guides that will try tell you that you have to pay for a guide to visit Air Terjun Sekumpul. This is not true. The track is clearly signposted and easy enough to navigate your way down to the falls without a guide. There is a small entrance fee of 20,000 Rupiah to visit Sekumpul Waterfall and the parking fee is 2,ooo Rupiah. 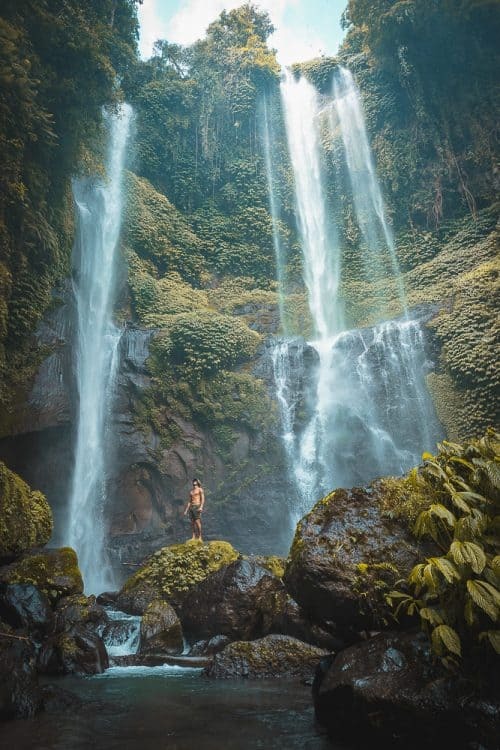 As you begin the 30-minute hike down through the lush bamboo forested valley to Sekumpul Waterfall you will come across an awesome viewpoint of the falls from a birds-eye perspective. The twin falls gushes down a whopping total of 80 meters before it reaches the rock pool at the base of the falls. 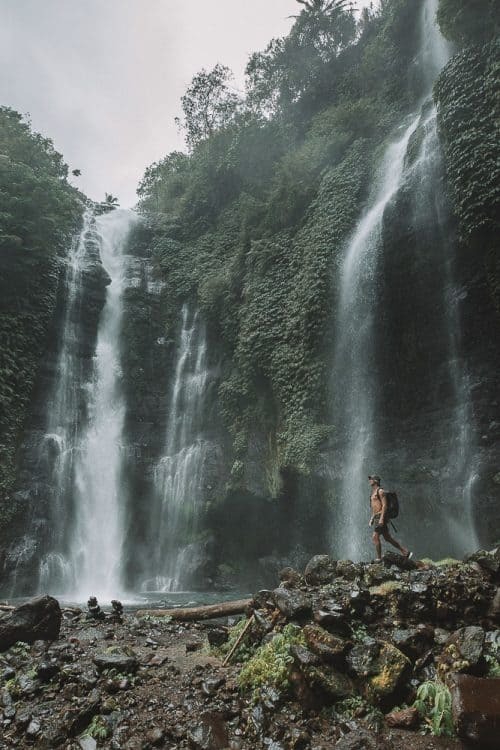 Continue to traverse through the forest until you reach a set of steep steps that will lead you to a shallow stream that you will have to cross to get to the base of Sekumpul Waterfall. You can swim in the rock pools beneath Sekumpul Waterfall though I don’t know how you will go trying to get directly beneath the falls as the force of water is very powerful. The Sekumpul Waterfall valley is a landscape photographers dream, although it can prove quite difficult to get a good photo of the falls from down in the basin as the misty spray is wild and consistent. Be prepared with a lens cleaner or a towel to wipe your camera lens clean of water every 5 seconds. The best time to visit Sekumpul Waterfall is anytime between mid-morning and 2pm to get the best lighting from the sun through the valley. Do bear in mind that it is a 2.5 hour ride each way so you may want to consider spending a night out in the northern region, (see below for some accommodation options). 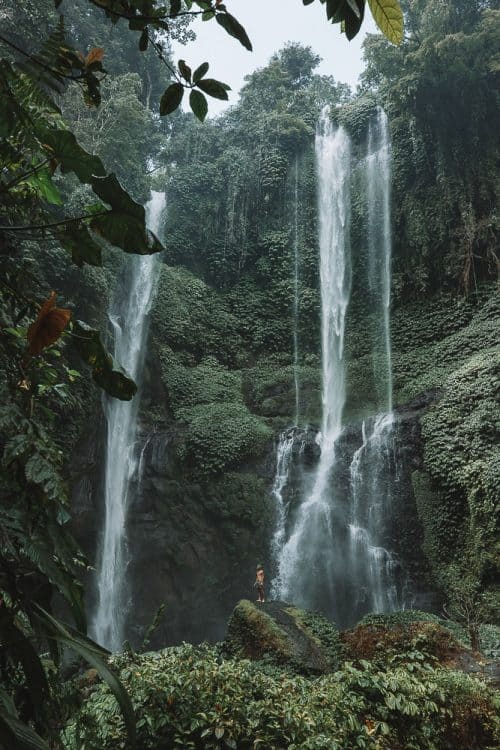 This also gives you the option to visit more of Bali’s Waterfalls such as Aling-Aling Waterfall and Banyu Wana Amerta Waterfall which are both located in the northern region of Bali. You may or may not know that Sekumpul in the local language translates to ‘collection’ or ‘group’ meaning that Sekumpul Waterfall is actually one of the multiple waterfalls. In fact, there are 5 or 6 waterfalls in the same valley. These can also be explored after you visit the main attraction of the twin falls. 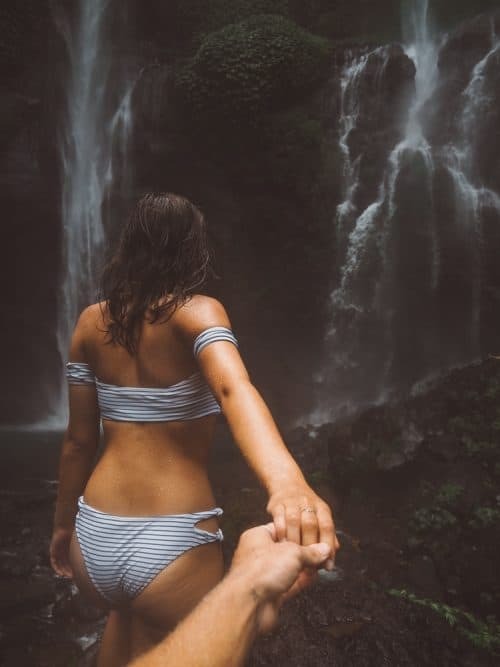 Each waterfall is within 5 – 10 minutes hiking of each other. You may have noticed in this article that I have used the words ‘Air Terjun’ which is also the local language and translates to ‘waterfall’. This is a little something to remember if you get lost when trying to find a waterfall and a sign posts reads Air Terjun, then you know that you are on the right track! 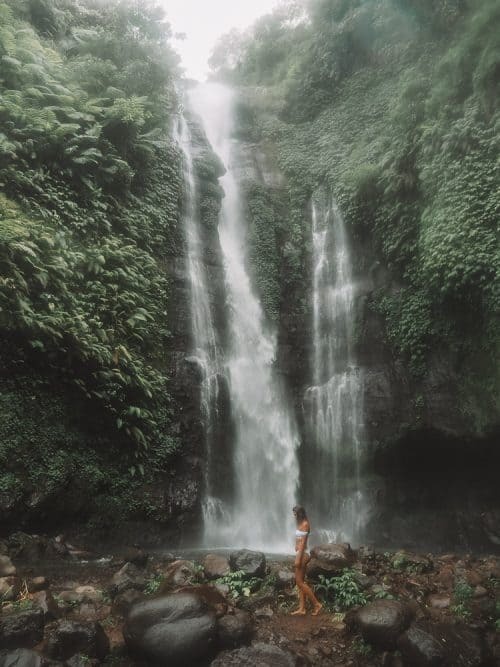 There are a number of accommodation options in the Bedugul area which is a town on the way to Sekumpul and also in Singaraja which is a beachside town in the north and close to Aling-Aling Waterfall and Lovina Beach. For other places to stay in Bedugul you can check other options by CLICKING HERE. For other places to stay in Singaraja you can check other options by CLICKING HERE. 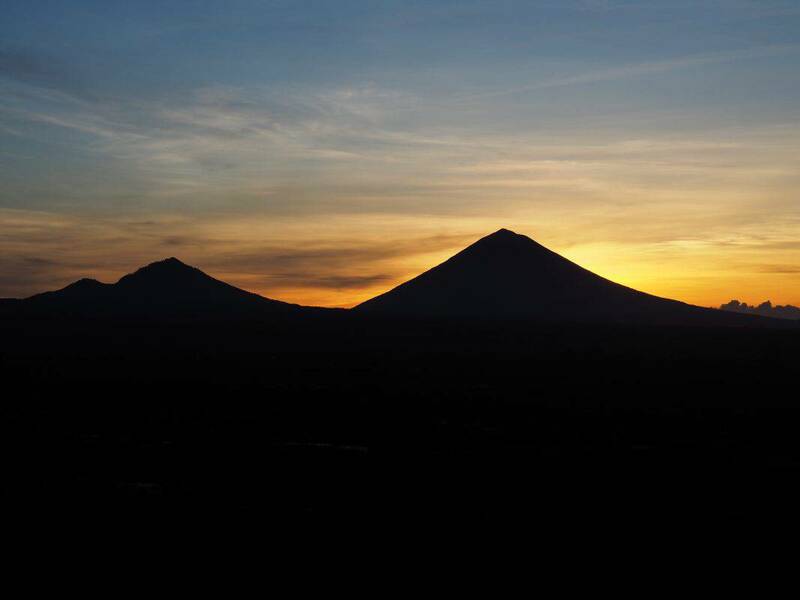 The northern region of Bali is an adventurers wonderland that has so much to offer! 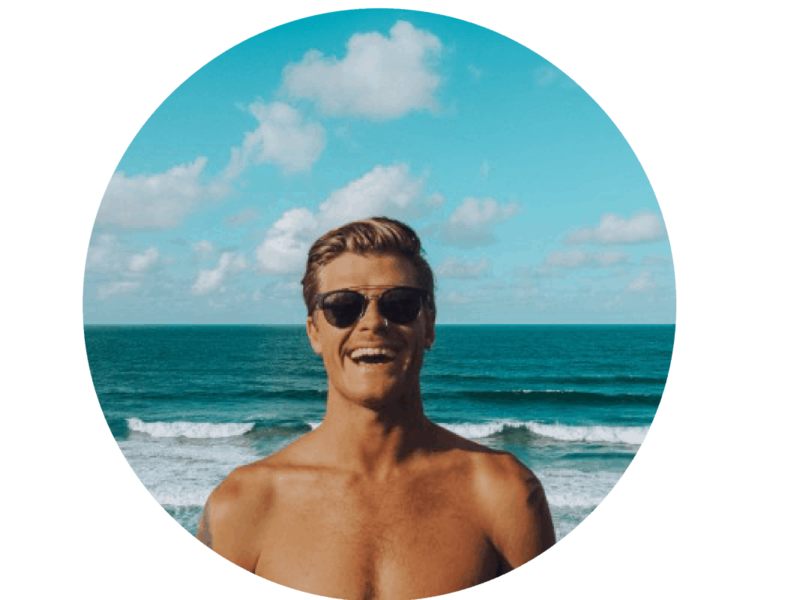 Be sure to read my other related blog posts to discover more of Bali’s most iconic locations and other incredible waterfalls! Click on the links below to see other related posts! I hope you enjoyed reading this article and if you have any questions about Sekumpul Waterfall please leave me a comment below.